AFTER SIX attempts, the TT Red Force finally registered a first-class victory yesterday at the Brian Lara Cricket Academy. With a previous record of five defeats and a draw at the Tarouba venue, the Red Force wrapped up an 85-run win over the Jamaica Scorpions in their final match of the 2018-2019 West Indies Four-Day Championship. The result saw the Red Force finish fourth in the standings with four wins, five losses and one drawn match. It was a turbulent campaign for TT, with coach Kelvin Williams being replaced by Mervyn Dillon just four games into the competition. Under coach Dillon, TT closed the season with three wins, two defeats and one draw. Set 338 to win yesterday, the Scorpions got an enterprising and entertaining knock of 133 (119 deliveries, 18 fours and four sixes) from Brandon King, but the Red Force did not back down and completed the win less than an hour into the final session, as they dismissed the visitors for 252. The Scorpions’ opening pair of John Campbell and Garth Garvey had a partnership of 23 before Garvey sliced an attempted on-drive from fast bowler Shannon Gabriel to second slip. Campbell (25) and Jermaine Blackwood (duck) were then removed by fast bowler Anderson Phillip in the space of four balls. 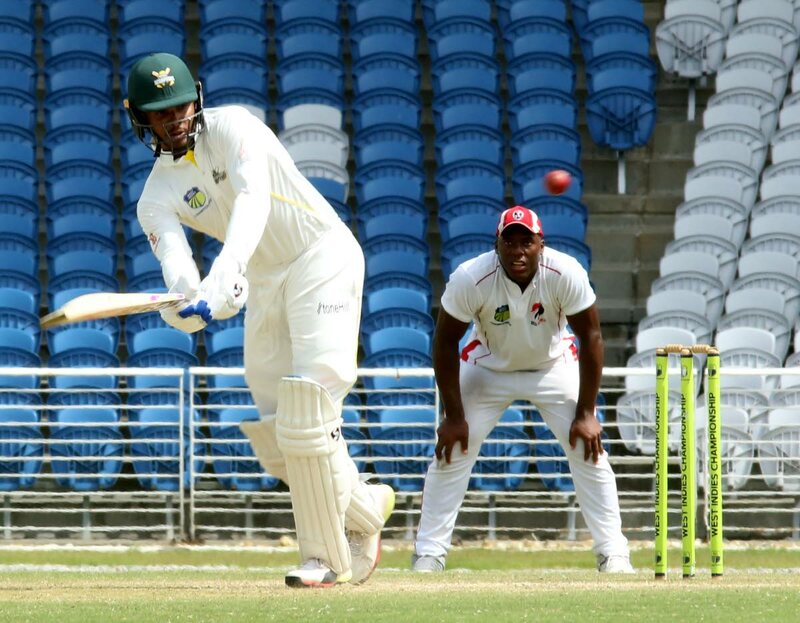 Fudadin edged a drive from Odean Smith onto his stumps to leave the Scorpions precariously placed at 67/4, before King was joined by his captain Paul Palmer for a crucial fifth-wicket stand of 75. However, Palmer (18) was dismissed by Smith, edging an attempted drive to the slips. Smith sent back Nkrumah Bonner (eight) shortly after, via the leg-before route, but King soldiered on to bring up his second first-class hundred. With the Scorpions on 209/6 at tea, with King on 125 and Kennar Lewis on 11, there seemed some jitters in the Red Force camp. However, they were eliminated in the first over after tea. King, going for his third boundary in Imran Khan’s fifth over, drove the leg-spinner to long-off, and Lewis (12) followed in the next over, sweeping left-armer Khary Pierre to Khan at deep square leg. Khan, who finished with figures of 3/48, completed proceedings with the wickets of Nicholson Gordon, who was bowled attempting an almighty heave, and Akim Frazer (13) who prodded one to silly mid-on. Smith ended with 3/56 and Phillip 2/54 for the Red Force. In the morning session the hosts, who started the day on 282/9, were bowled out for 295 with Man of the Match Jason Mohammed unbeaten on 110 (155 balls, eight fours and three sixes). Scores: RED FORCE 389 (Jason Mohammed 94, Kyle Hope 64, Jeremy Solozano 63, Denesh Ramdin 41, Khary Pierre 31; Nicholson Gordon 7-70) and 295 (Jason Mohammed 110 not out, Kyle Hope 47, Odean Smith 30; Jermaine Blackwood 3-39, Akeem Fraser 3-56, Nkrumah Bonner 2-72) vs JAMAICA SCORPIONS 347 (Jermaine Blackwood 66, Nkrumah Bonner 61, Brandon King 59, Paul Palmer 30; Anderson Philip 5-74, Shannon Gabriel 3-51) and 252 (Brandon King 133, John Campbell 25; Imran Khan 3-48, Odean Smith 3-56, Anderson Philip 2-54). Reply to "Red Force beat Jamaica to finish 4th"